Rovio released its latest Angry Birds app this month called Bad Piggies. The techies of the world have already flooded the Web with their way too technical reviews. In fact, what the techies were doing is writing a persuasive piece, just like we do in the classroom. It's always good to let students write about what they know about and care about. Yes, you'll get better results. 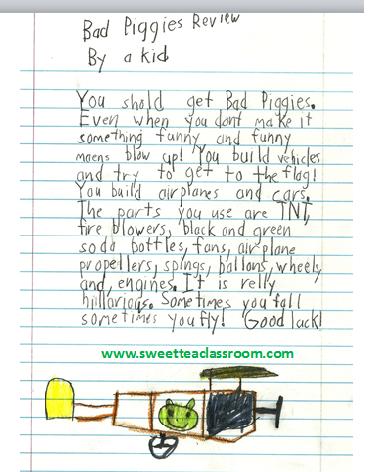 So, without further ado, here's an 8-year-old's review of Bad Piggies. It's also a persuasive paragraph that meets Common Core standards. You should get Bad Piggies. Even when you don't make it, something funny, and funny means blows up [happens]. You build vehicles and try to get to the flag! You build airplanes and cars. The parts you use are TNT, fire blowers, black and green soda bottles, fans, airplane propellers, springs, balloons, wheels, and engines It is really hilarious. Sometimes you fall. Sometimes you fly! Good Luck! The key to persausive paragraphs is letting students persuade others to do something they like or care about. As a case in point, look at all those words that this eight-year-old tackled. There's even a super topic sentence. What a great way to make writing relevant! You could also have students record their review as a podcast or make a video with scenes from the app.